While I'm still waiting to hear about that job at Stark Industries (at least give me an interview! 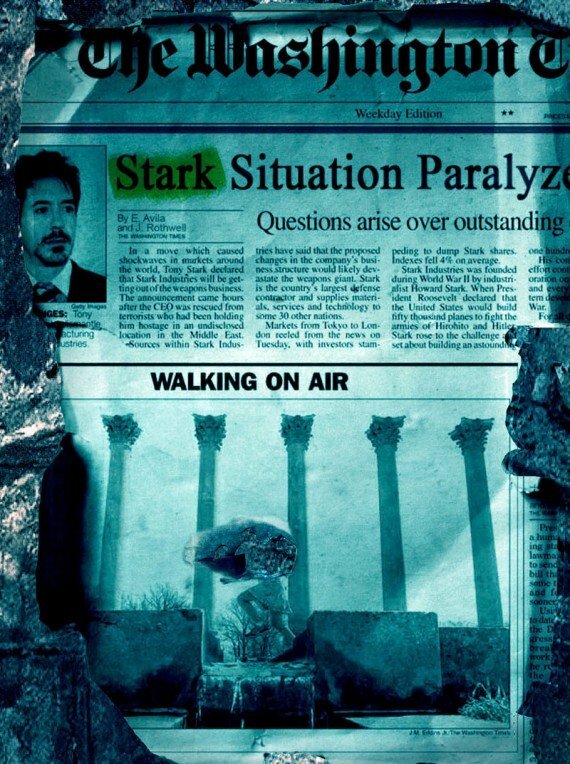 ), the viral campaign behind Iron Man 2 has released its second puzzle piece this week with another article about Tony Stark. While the text doesn't give us anything we didn't know (it was written after Stark's announcement that his company would no longer be making weapons), the appearance of the article is another story. First off is the fact that a picture that doesn't belong to the article is clipped and appears to be scorched. The photograph itself is what appears to be a woman running in front of some columns, but the top half of her body has been burned away. Like the first, this article also has a piece of its headline highlighted, this time the word being "Stark" (it was "Secret" in the first one). It still seems fairly impossible to grasp the direction that the campaign is headed in, but if you have any ideas, feel free to leave them in the comments section. Check out the article below or full size over at ScreenRant.